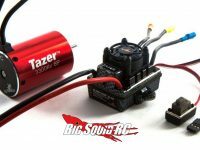 fuze « Big Squid RC – RC Car and Truck News, Reviews, Videos, and More! You are browsing the "fuze" tag archive. Dynamite has announced that they will be releasing updated versions of their affordable sensored and sensorless Fuze brushless combos. The updated ESC’s are all 3S lipo capable, and several motor winds will be available. Keep an eye on the Dynamite Website for more details.